The race series that employs me, the 24 Hours of LeMons, is now in its busiest part of the year, and that means I don’t always have time to drive something suitable for a Race Organizer Review to every event. A couple of weeks ago, I opted for a rental Chrysler 200 at the Pacific Northworst race, but before that I took a blindingly orange-and-white Fiat 500e to San Francisco for some LeMons administrative meetings. Why not follow up a silly-looking yet oddly practical Italian car with an Italian car that makes no sense? Last weekend, I picked up a Rosso Competizione Alfa Romeo 4C at Midway Airport and drove it to the Autobahn Country Club for the 2015 Doin’ Time In Joliet 24 Hours of LeMons. My introduction to the 4C involved checking off many items from its long list of weak points: fitting my luggage in the car, climbing in and out of the car multiple times while rearranging everything, driving on rough Chicago streets and then in afternoon rush hour stop-and-go traffic. My Autoweek colleagues have acknowledged some of these weak points, but started their 4C experiences with activities at which the 4C excels. All of this got me to thinking about the Cool-to-Sensible Spectrum. At the far extreme right side of the CTSS, you have the minivan, which is the most sensible vehicle ever made. On the far extreme left side of the CTSS, you have rail dragsters, minitrucks with dancing beds, Lunar Rovers, and so forth. Get a minivan, you’ll get things done, but your soul will wither and die. Daily-drive Brutus, your life will become a series of terrible misunderstandings, but you’ll stand 10 foot tall with a knife. The 4C is about as far to the left side of this spectrum as you can get with a brand-new street-legal car; jillion-buck supercars actually make more sense, despite their loony performance numbers and wild appearance, because flaunting wealth and/or high-end bad taste brings tangible benefits to the car’s owner. Since I own a very cool yet laughably impractical car in yowling red paint, I enjoy spending time on the left side of the Cool-to-Sensible Spectrum. In fact, the ride of the 4C on potholed roads and uneven highway pavement is remarkably similar to that of my chopped-and-slammed Corona on its 55-year-old bias-plies, and the contortions needed to enter and exit the driver’s seat are similar in both cars. 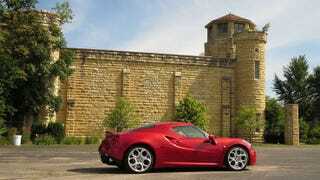 The Kustom Korona, however, has a trunk, while the 4C boasts a cruel, tiny, engine-heat-soaked parody of a luggage compartment. My duties as both race official and journalist require that I haul a lot of gear to LeMons races, and so I ended up belting my bags into the 4C’s passenger seat.